Universal Orlando guests can now experience the magic of Christmastime in the Wizarding World of Harry Potter (WWoHP) Hogsmeade and Diagon Alley. You’ve asked for a holiday overlay in the Wizarding World, and now you can experience it. 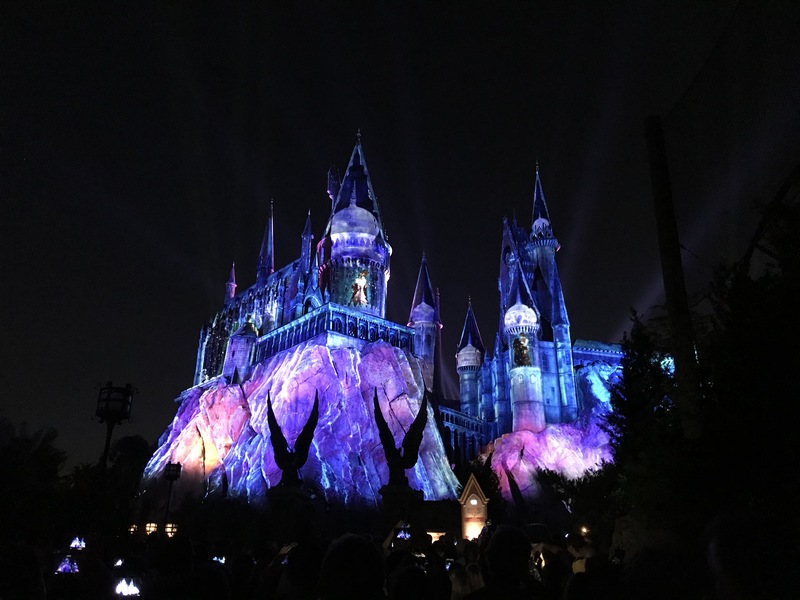 From Christmas Pudding at the Leaky Cauldron to the Magic of Hogwarts Castle mapped projection show, your holiday spirits will be uplifted throughout the Wizarding World. This marked the first year that the WWoHP receives a Christmas overlay during the holiday season, and it is not to be missed. Between Grinchmas (see my review from last year as it is largely unchanged) at Islands of Adventure, the Mannheim Steamroller, Holiday Parade, and Harry Potter Christmas at Universal Studios (as well as HP IoA), you will find plenty to fill your day. In fact, my friend Dani and I found so much to do that we didn’t experience one ride because the time just wasn’t there. But when you’ve ridden everything hundreds of times, you feel that there is the time to spend on the limited time engagements. For months, I have been looking forward to the brand new Harry Potter Holiday offerings at Universal Orlando. This will be the first time that JK’s WWoHP will receive a seasonal overlay of decorations and attraction offerings. Now that WWoHP has received the Christmas treatment, perhaps Halloween will be next! Between both parks at Universal Orlando Resort, there is a world of holiday happiness around every corner, or in this case, through walls. With so much going on, it can be a little daunting to try to fit everything into a day. For annual passholders who visit regularly, this won’t seem as tough because the rides can be skipped. For those who are visiting on vacation, definitely consult the Universal Orlando app or website for show schedules in order to map out your day to make sure you get everything in (for vacationers, you definitely need to plan 2 full days minimum). On our way to the park, Dani and I looked at the park schedule on our way across the I-4 and made a general itinerary of the order in which we wanted to experience the limited time engagements. If you plan out your itinerary, you’ll find that getting to see the shows and parades you want will be much easier and definitely less stressful once in the park. Our first stop was Diagon Alley to see the There’s Nothing Like a Holiday Spell Celestina Warbeck show. I adore this show, and often watch it when I am in the park. Her voice, the costumes, and music genuinely create the atmosphere of a 1940s jazz nightclub. The Celestina Warbeck show still has the quintessential Wizarding flare to it, and the original songs were superb! Expecting no less, Celestina’s Christmas gown was drop dead gorgeous and her Banshees were killer as well. Although the vocal artists/character performers who portray Celestina always look like they are having a great time, the degree of enthusiasm from Celestina was greatly increased during the show. I imagine it’s due to the show being new, and it’s a break from the regular song lineup. If I could suggest one way to start your holidays at Universal Orlando, this is the show that I would recommend hands down. And get this, at the finale of the show, Diagon Alley is covered in snow flurries! After leaving the Celestina show, Dani and I made our way to the Leaky Cauldron to see the decorations and to see if they had some seasonal offerings on their menu. To our delight, there were some additional items AND a Christmas Pudding for dessert! I’ve read of Christmas Pudding in Charles Dickens’ timeless masterpiece A Christmas Carol, but never had the opportunity to try one. Without even knowing what was in it, Dani and I both ordered the pudding with her banger sandwich (her regular) and my Guinness lamb & beef stew (my regular). Although the interior of The Leaky Cauldron is not nearly as decorated as the streets of Diagon Alley, the subtle additions of pine garland created a festive atmosphere. After eating out main courses, it was time to dive into our Christmas Pudding. The mini pudding came out in the shape of a bundt cake with icing on the side to drizzle over top of the pudding. I was aware that British puddings were more like buddy cakes, but still to see a pudding in that shape was pretty cool. Once the icing was drizzled, Dani and I sunk our forks into the moist pudding and took our respective bites simultaneously. It was unanimous–YUMM! We both absolutely loved the pudding. Its flavor reminded us both of a spice cake with currents. Hints of cinnamon and sugar were also found in the pudding. We would both definitely order the Christmas pudding again. After our early dinner, we were ready to board the Hogwarts Express to Hogsmeade for the Magic of Hogwarts Castle show. Upon approach to Kings Cross Station, we saw the wait was 60mins; so needless to say, we decided to walk to IoA. On our way, we stopped in the Universal props store where they sell old props to attractions. With HHN having ended just a couple weeks prior, there were many HHN props and decorations for sale. Annual Passholders do not get a discount at this store, but it’s definitely worth a browse because you may find a piece to a show or ride that you enjoy. Once we arrived at IoA, we were greeted with a new holiday mix of music at the Port of Entry instead of the whimsical tunes that are present for most of the year. On our way to WWoHP Hogsmeade, we passed through Dr. Seuss Landing. In no area is there a greater feeling of Christmas than in Seuss Landing. Much like Dickens is credited for inventing Christmas in how we commonly celebrate it, Seuss has also been incredibly instrumental in fostering the Christmas spirit through his brilliant book How the Grinch Stole Christmas. Since we saw the show last year, we did not make the time to see Grinchmas again this time. But, I plan to watch it before the holiday season is over. If you haven’t seem it, definitely check it out as it is the live theatrical presentation of How the Grinch Stole Christmas. As The Lorax is a favorite book of ours, we stopped to take a picture with he who “speaks for the trees” since he decorated the Onceler’s place for Christmas. We arrived at the base of Hogwarts Castle about 1hr prior to showtime, and there were already about a dozen or so groups of people sitting down in the taped off viewing area for the show. With the queue for Forbidden Journey reading 45mins, we decided to go ahead and select our spot for the new show on its debut weekend. It’s a good thing that we did, because in no time at tall, the area was filling up quickly. Since the show begins at sundown (the times guide states dusk–believe me, it’s after sundown), the start time varies based upon sunset. As the sun goes down, you’ll notice that the cliffs beneath the castle begin to get covered in snow. I’m aware that is mapped prediction, but the snow dropped cliffs look quite real. You’ll begin to hear the familiar Harry Potter theme as snow falls over the castle, and that marks the beginning of the show. And, such an amazing show it is! Simply breathtaking. It has a great blend of familiar images from the movies as well as Christmas animations. The song selection was excellent and paired with eat animations nicely. Whether you have seen the Harry Potter movies or not will not negatively impact your experience of this seasonal show. It is enjoyable for everyone! There is a warmth that iminates from Hogwarts during the show that will have you completely wrapped in the magic of the season. After making our way through the overly crowded and disorganized streets of Hogsmeade (I’ve heard Universal modified the guest flow of traffic on night two, which is good because leaving the courtyard was horrendous Saturday night), we quickly headed for the Christmas Music of Mannheim Steamroller concert at Universal Studios. I don’t know about you, but I grew up with the music of Mannheim Steamroller at Christmastime, and I look forward to their limited time engagement at Universal Studios Florida every year. Even if you do not know them by name, it is highly likely that you are familiar with Chip Davis’ combination of synth and orchestra pieces. The company at Universal is the Mannheim Steamroller Orlando compliment and not the full company (because they are touring at this time), but the sound is just as big and the showmanship is excellent. Since my mom does not live around here, I made sure to FaceTime with her so she could vicariously enjoy the concert with me from 500mi away. Attending the concert was the perfect way to end our day of holiday enjoyment at Universal Orlando. Suffice it to say, Universal Orlando has done an outstanding job with its special limited time holly jolly holiday offerings this year. The addition of the Christmas overlay in the WWoHP more than doubles the festive events going on now. Don’t miss out on the “magic” of Christmas at Universal Studios and Islands of Adventure this holiday season.